With four backyard chickens, if I don’t make eggs for a week, we end up with a fridge full of eggs! 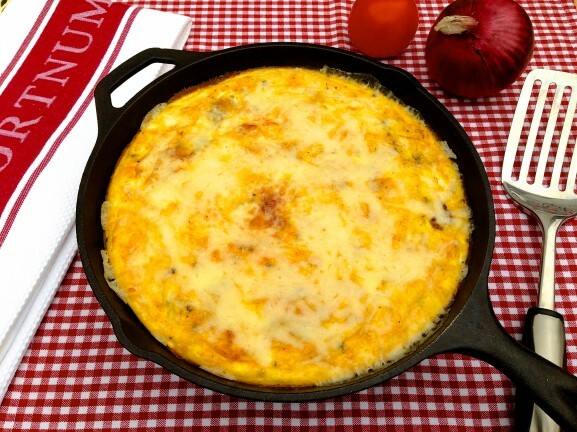 A frittata is the perfect way to enjoy eggs for dinner and, even if you don’t have chickens of your own, is an economical way to provide a flavorful, high-protein meal. Frittatas are easy and versatile and can also be healthy and delicious. This recipe was the product of an evening when I needed dinner in short order yet had no plan and felt as though I had the proverbial “nothing” in the refrigerator. I try to keep a few staples in reserve for these kind of nights. Beyond eggs, some of the additional foods I typically have on hand include a couple types of cheese, greens of some sort, apples and oranges, onions, nuts, some frozen veggies, and a package of ground beef in the freezer. Maintaining a steady supply of your favorite “basics” can make fast food a reality—it will be a healthy and delicious version though, and from your own kitchen. Eggs and ground beef were the starting point the first time I made this frittata. I was initially wishing I had sausage, but the recipe sort of fell into place as I thought about what makes a great hamburger. For subsequent dinners, I have tweaked the recipe to include a few condiments…every burger needs some ketchup and mustard, right? Although it is delicious unadorned, tomato and avocado are two of my favorite toppings. 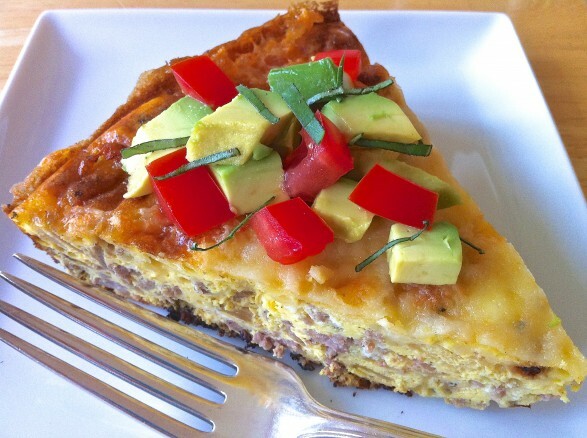 A bacon cheeseburger frittata is a surefire hit, too. For another option, prepare this recipe with your favorite sausage; simply omit the ketchup mixture. Optional toppings: chopped tomato, avocado, red onion, sautéed mushrooms, bacon, or any toppings you would enjoy on a hamburger. In a large bowl, whisk together the eggs, milk, salt and pepper, and 1 cup of the cheese, and then set aside. In a small bowl, stir together the ketchup, Dijon, and Worcestershire sauce, and set that aside. Heat the olive oil in a 10-inch, oven-proof skillet (cast iron works well) over medium heat. Add the onion and sauté 2-3 minutes until softened. Add the ground beef and cook, breaking up and stirring as you go, until the meat is no longer pink. Drain any excess grease. Stir in the ketchup mixture until the beef mixture is evenly coated. Then add the egg mixture and make sure the beef is well distributed over the pan. Bake for 20-25 minutes or until just set in the middle. Remove from the oven. Top with the remaining 1/4 cup of cheese and broil, watching closely, for 1-2 minutes or until the cheese is melted and the top turns golden brown. Serve as is, or garnish with optional toppings. Leftovers are delicious. Reheat or serve at room temperature. This recipe is featured at The Tumbleweed Contessa and Foodie Friends Friday. I love this, Ann. Putting it on my menu soon! Thank you, Brianne! I hope it is as much a hit with your family as it is with mine. I am always happy to have a leftover piece for lunch, too! We are having a Super Bowl Party. This would be a great addition to our selection. Hope you can drop by. Thank you for the invitation! I just popped over your way, shared the link, and saw lots of delicious looking recipes! Thanks for bringing this by our Super Bowl party. It is perfect for our lineup! These are ingredients I usually have on hand. You are most welcome! I shared a fun find from your site on my Facebook page yesterday. Hope that sends a few new people to see all the delicious-looking recipes you have collected. Wishing you a wonderful weekend, too! This is brilliant. I can’t wait to give it a try. Thanks for sharing on foodie friends friday. Thank you, Marlene! Happy to share one of our much-enjoyed meals! This was a huge hit with the boys and they loved mixing the sauce and cracking the eggs. My husband and I were doing the South Beach Diet for a while and this Cheeseburger Frittata recipe has become a go to recipe for no carbs. Delicious!